One of the most critical factors for safe driving on the road has to do with experience. Experienced motorcycle riders can handle unanticipated circumstances, such as inclement weather conditions or sharp turns, in a much better fashion than inexperienced motorcycle riders. Inexperienced motorcycle rider accidents occur when a rider is unable to assess risks that road conditions pose, unable to respond to sudden events or does not have the skills and techniques necessary for safe operation of a motorcycle. An inexperienced rider may not be able to handle rough road conditions, and he or she may end up in an accident as a result. If you are a rider who has been involved in inexperienced motorcycle rider accidents, then you should immediately seek help from a motorcycle accident lawyer. Illinois motorcycle accident attorneys are ready to help you with your case. You can receive a free case evaluation for your claim and determine the best way to move forward in claiming the compensation that you deserve. A recent research study published in the U.S. National Library of Medicine revealed that driving experience has a high correlation to the number of accidents that a driver may be involved in during his or her life. The case-control study found that the odds of one being involved in a crash decreased as one gained additional years of driving experience. Drivers with one to four years had an odds ratio of 0.60 for being involved in an accident. Drivers with five to nine years of experience had an odds ratio of 0.50 for being involved in a crash. Drivers with ten years of experience or more had an odds ratio of 0.36 for being involved in an accident. Before motorcycle riders head out onto the road, they can do themselves a favor and try to gain as much riding experience as possible. Another research study published in Accident Analysis and Prevention has found that more experienced riders are also able to be more perceptive in regards to hazards on the road. An experienced rider is better able to avoid dangers on the road and can anticipate dangerous situations on the road. Motorcycle riders can also enroll in riding courses that will help them learn how to react to dangerous circumstances on the road. A riding course can help a motorcycle rider learn how to deal with hazardous road conditions. Riders may learn the right techniques for swerving to avoid an accident or avoiding involvement in a car accident. One of the easiest ways for new drivers to avoid involvement in motorcycle accidents is to pay attention to road conditions. 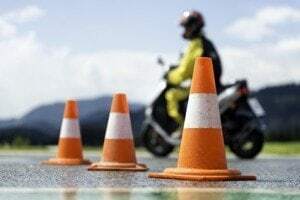 If young riders can remain alert to the hazardous conditions of public roads while riding, they might be able to react to obstructions on the road suddenly. Obstacles like fallen tree limbs, litter, animals or even crash vehicles can pose an immediate danger to inexperienced riders on the road. It is essential for inexperienced riders to be ready to react and avoid these unexpected dangers. In addition to obstructions that may be in one’s path on the road, motorcycle drivers should also be ready to deal with roads that defectively designed or the result of shoddy construction. Poorly designed roads can present hazards for a biker when maneuvering the motorcycle. Inexperienced bikers can avoid this danger by riding with caution and moving slowly over roads with inferior designs. If an inexperienced rider is involved in an accident due to a road with a poor design, he or she may be eligible to claim damages. A city may be responsible for the upkeep or safe design of roads and may be liable for damages. Contact our Illinois motorcycle accident attorneys today to learn more about your legal case. You may have various claims to file against municipalities or other drivers on the road. It is in your best interest to fully understand your legal rights and find a lawyer who will advocate for you.